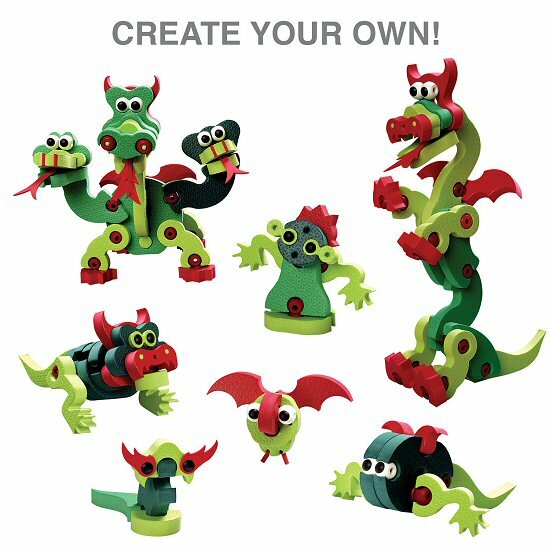 With this amazing Dragons & Reptiles Bloco foam building set, you can follow the instructions to build dragons, snakes, and an alligator or let your creativity take over and construct reptilian creatures based on your own imagination! 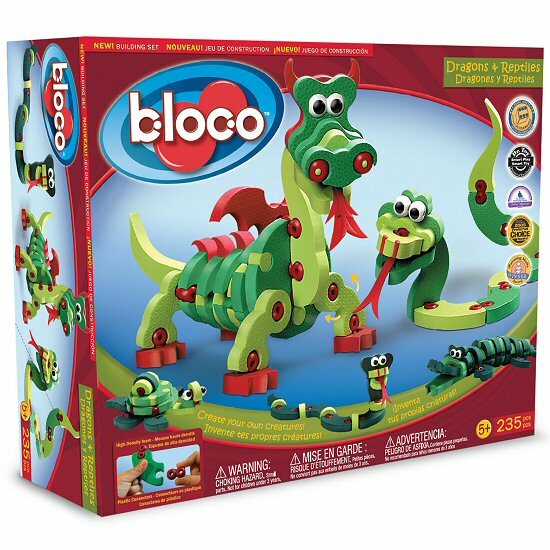 And once you've assembled your dragons, snakes, or other fantastic creations, these Bloco toys go from creating to playing as they are durable enough for imaginative play and adventure. This Bloco Dragons & Reptiles foam building set is an edutaining toy that builds motor and spatial skills and with the ability to take your creations apart and start again, you'll enjoy hours of creative construction and play. Bloco is a one-of-a-kind construction toy that uses high-density foam designed in unique shapes with specialized plastic connectors. Pieces link together and rotate at any angle. You can build easy flat models or stack the pieces to create fantastic 3D creatures. Build the illustrated designs or let your imagination take charge! 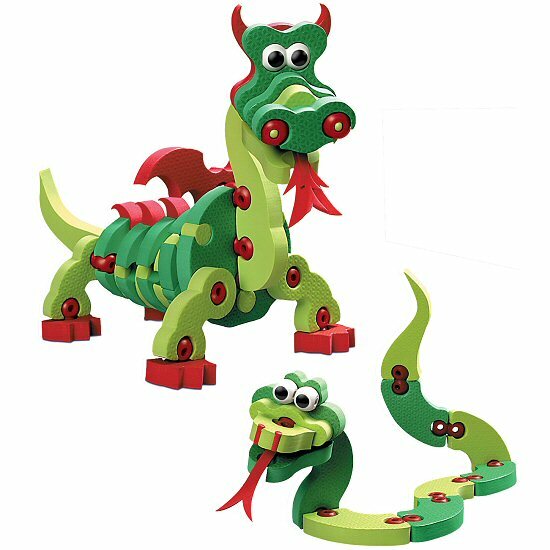 Note: This Dragons & Reptiles construction set can be combined with other Bloco foam building sets to create even more interesting creatures. The Minotaur Bloco foam building set lets you build your own fun creations: Tough or funny, mean or cute, you decide how it looks. This Bloco The Troll set lets you build your favorite trolls: dwarfish or giant, nice or naughty, silly or clever, simply as you wish! This Tiger & Panda Bloco foam building set includes instructions for a giant panda, tiger, baby panda, praying mantis, and bamboo shoot. This Wildcats Bloco foam building set includes instructions for a tiger, leopard, cat, saber tooth tiger, and 2 lions. Create a princess or medieval knight's paradise with this adorable Dragon fabric wall art. Flame is soft and cuddly with plush red fur, fun felt claws, shiny red and silver wings and accents, and big sleepy yellow eyes. Sour Apple, this adorable Li'l Sweet & Sassy stuffed dragon, has soft green fur and sparkly blue eyes. Pinkster dragon plush animal has big feet with pink felt claws, a cuddly body, and soft hot pink fur.